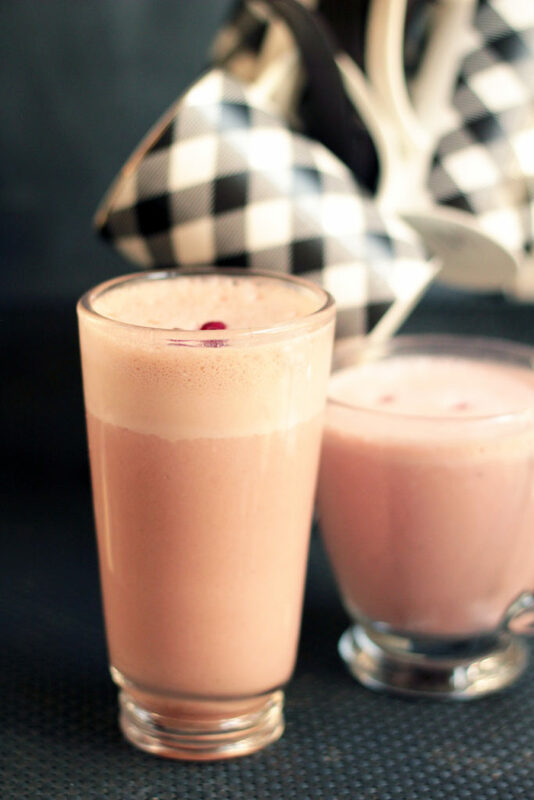 A Pomegranate Chai Smoothie that includes 8 ounces of Pom Wonderful 100% pomegranate juice is how I recover after exercise and how I drink to good health. Disclosure: I received free samples of POM Wonderful mentioned in this post. By posting this recipe I am entering a recipe contest sponsored by POM Wonderful and am eligible to win prizes associated with the contest. I was not compensated for my time. Your 2018 New Year’s Resolutions are in full swing, making it the perfect time to talk about something #CrazyHealthy. That something, is POM Wonderful 100% Pomegranate Juice. What makes a juice #CrazyHealthy? First of all, as a registered dietitian using evidence based information to focus on nutrition from a healthy aging perspective, I am excited about the potential benefits of pomegranate juice on memory and cognition. In a preliminary 2013 UCLA study, it was found that a small group of older adults with age-related memory complaints who drank 8 ounces of pomegranate juice daily had increased verbal memory performance and functional brain activity in fMRI testing after just four weeks. *These early scientific results on the impact of pomegranate juice on the brain have not yet been adequately studied. Further clincial research on larger populations is needed to help establish causation and to determine the long term effects of pomegranate on memory and cognition. Including 8 ounces of pomegranate juice into my daily routine is easy because I love the slightly sweet, slightly tart taste of Pom Wonderful 100% Pomegranate Juice. The possibility that this juice may also be enhancing my memory and cognition makes it a win, win! Secondly, by integrating food with physical activity, I champion practical ways to reach health and fitness goals. I am ‘juiced up’ about the potential benefits Pom Wonderful 100% pomegranate juice has as a post workout beverage. Did you know 100% pomegranate juice is powered by unique polyphenols that early research suggests have promising results for post-workout muscle strength recovery? Certain types of polyphenol antioxidants, like those found in pomegranate juice, may help increase nitric oxide bioavailability by protecting if from breaking down in the body. Nitric oxide helps your body get the oxygen and nutrients it needs druing exercise. *Although the research reported is promising, additional clinical research is needed to establish causation and the potential impact of pomegranate polyphenols and exercise. Maintaining my ability to remain active as I age, is a high priority for me. 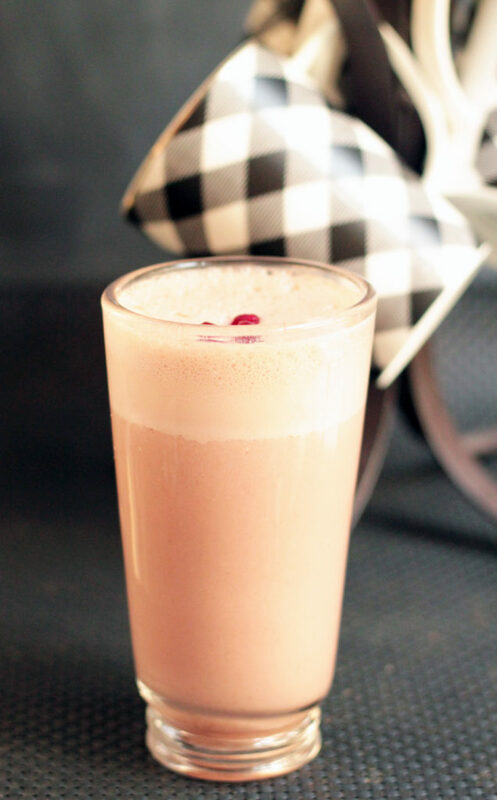 It’s one of the reasons I incorporate 8 ounces of pomegrantate juice into my routine after a bout of exercise, like this Pomegranate Chai Smoothie. Talk about drinking to your health! This smoothie has unique polyphenols plus everything else you need for recovery: fluid, protein for muscle protein synthesis (24 grams), carbohydrate for glycogen replacement(52 grams) and both sodium and potassium, (100 mg and 314 mg respectively). The taste of chai spices paired with 100% Pom Wonderful Pomegranate juice will delight your taste buds. Hold on cause there’s one more thing: this drink works as both a cold refreshing beverage and also as a warm smoothie! 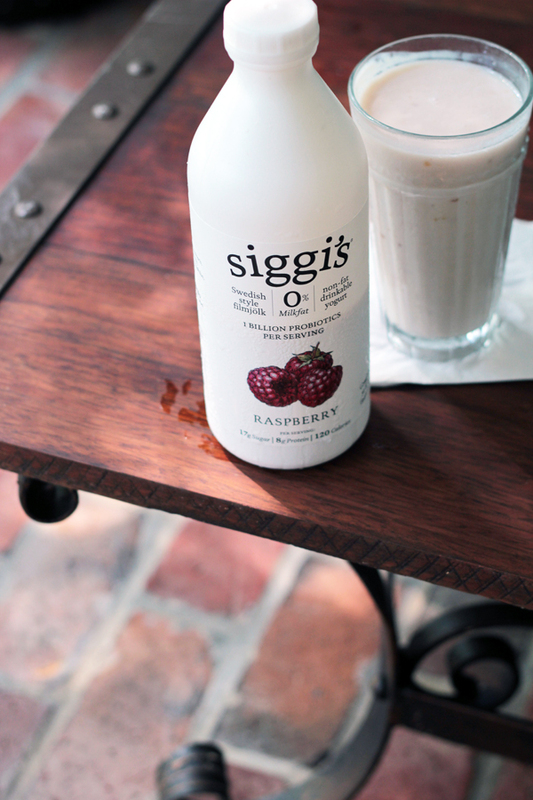 Either way, you get the benefits of a delicious post workout beverage. Be sure to see the links at the bottom of this post for more #CrazyHealthy ideas from the Recipe Redux team! Place ingredients from pomegranate juice thru ice cubes into a blender container. Cover and mix until smooth. Garnish with pomegranate arils. Serve immediately. Place ingredients from pomegranate juice thru allspice into blender (omitting ice altogether). Cover and mix until smooth. 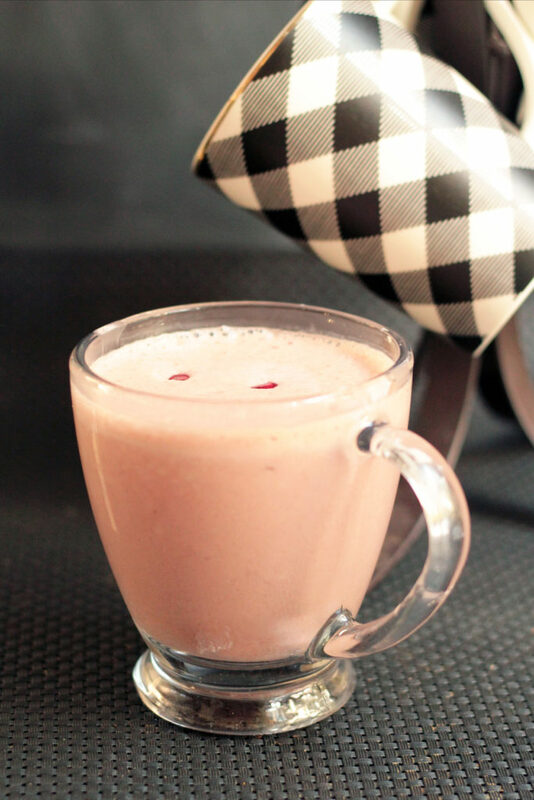 Pour blended beverage into a microwavable mug and heat on medium high (70%) for 15 seconds. Remove and stir. Test for temperature. Repeat until desired temperature is reached. Garnish with pomegranate arils. Serve immediately. … for their non-fat drinkable yogurt, aka filmjolk. 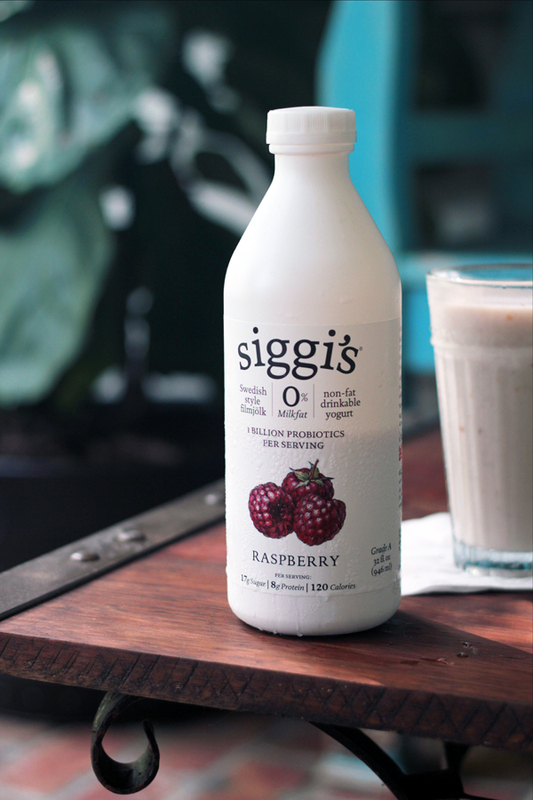 Disclosure: I am a siggi’s ambassador. 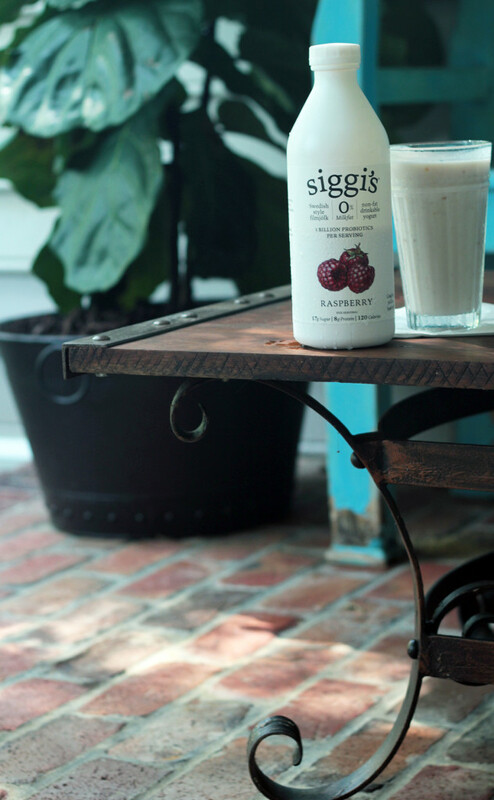 By including siggis in my blog post I am eligible to win a trip to FNCE in Boston. I was not compensated for my time. Opinions are my own. which includes rehydrating and replacing electrolytes lost during exercise (8 ounces provides 120 mg sodium and 240 mg potassium); preparing for tomorrow’s run by replacing glycogen stores (8 ounces provides 22 grams of carbohydrate); and repairing lean muscle with high quality protein (8 ounces provides 8 grams of milk protein.) Now here’s the icing on the cake, it’s also rich in probiotic cultures (1 billion probiotics per serving)! The tangy taste makes filmjölk the bomb! sugar, aspartame, gelatin, artifical colorings , preservatives, or high fructose corn syrup. I think being active and eating healthy should be simple and straighforward. 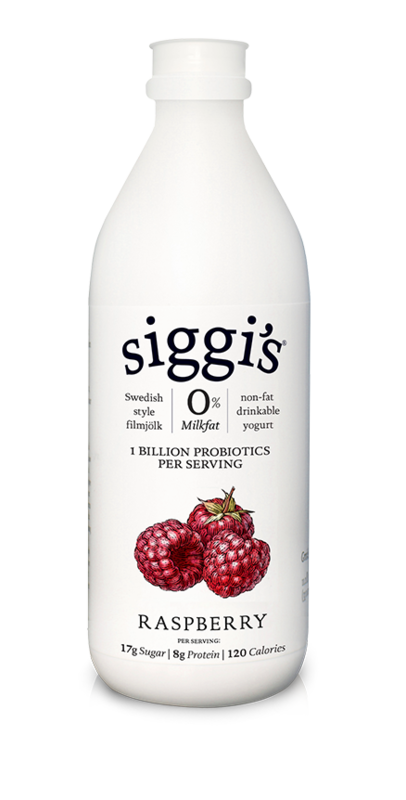 Thank you siggi’s, for facilitating my healthy lifestyle. 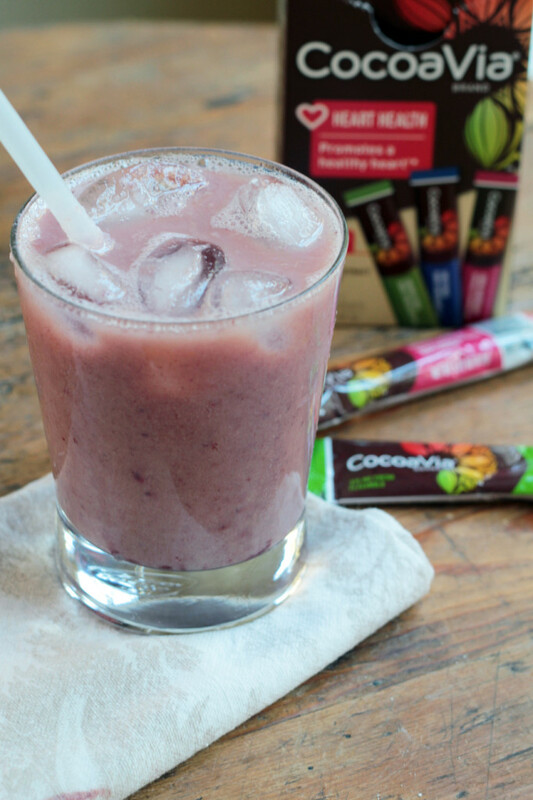 One minute is all it takes to make this Three Fruit Smoothie with CocoaVia® Cran-Raspberry supplement packs for your daily dose of cocoa flavanols. Disclosure: I was asked to participate in the CocoaVia® #HeartMonth campaign as a member of Healthy Aperture Blogger Network. I received samples of CocoaVia® product mentioned in this post and I was compensated for my time. Call me a preservationist. Call me high maintenance. The upkeep of my body is a priority, but I DON’T mean in a primping kinda way. (I’m the gal who six out of seven days, opts for a ponytail over a self imposed blow-out.) While waxing, polishing and shellacking would probably help make me look more like I have it together, I tend to work things from the inside out. So I invest my time in eating right and exercising daily. If you’ve been reading my blog, you know I love muscles. In my post on 10 Reasons Why You Should Care About Muscle Maintenance, I explain it’s not just about being bigger and stronger. More than any other single factor, muscle loss is responsible for the frailty and diminished vitality we associate with old age. But did you know your heart is also a muscle? Yep, and I ‘m just as passionate about preserving my ticker, as I am in preserving my biceps! 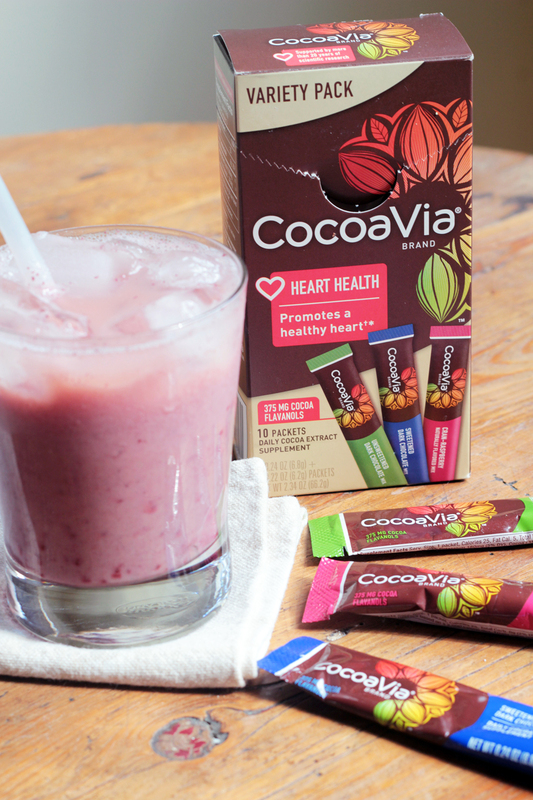 February is the perfect month to talk about matters of the heart, so today I want to encourage you to give yours little extra TLC everyday with CocoaVia® cocoa extract supplement. The cocoa flavanols in CocoaVia® are backed by two decades of scientific research that suggests these powerful plant-derived nutrients from cocoa beans may play a valuable role in cardiovascular health. If you’re asking, ‘Why not just eat chocolate?’, you’re asking a good question! Chocolate is a fabulous treat, but it’s not a reliable way to get sufficient quantities of cocoa flavanols. Traditional cocoa processing, which includes drying, fermenting and roasting of beans, destroys many of the flavanols naturally present in the cocoa bean. CocoaVia® supplement isolates the “good stuff” in chocolate in a convenient, versatile form, without all the calories and fat. Evidence strongly suggests, your health (and ability reduce age related decline) depends on the combination of your genes and your lifestyle. 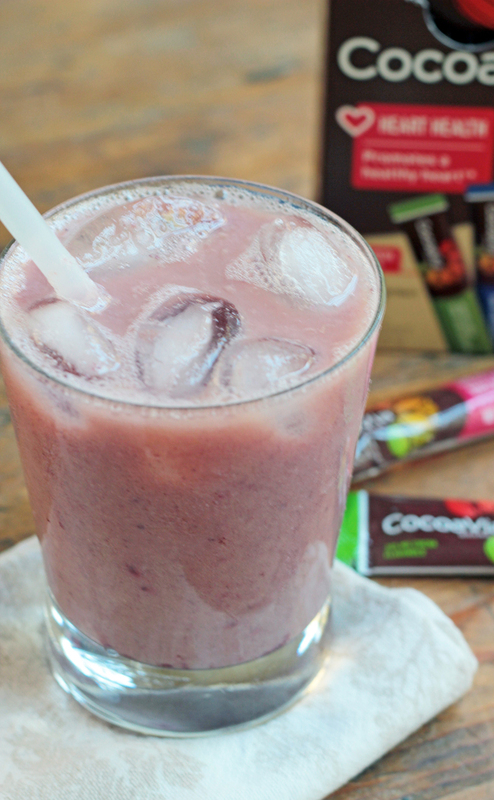 Join me in adding CocoaVia® to your daily routine! To learn more, be sure to check out the website www.cocoavia.com<rel=”nofollow”/a> and find more delicious recipes using CocoaVia® Brand here . † This statement has not been evaluated by the Food and Drug Administration. This produce is not intended to diagnose, treat , cure or prevent any disease. 1. Fill a drinking glass with ice. Set aside. 2. 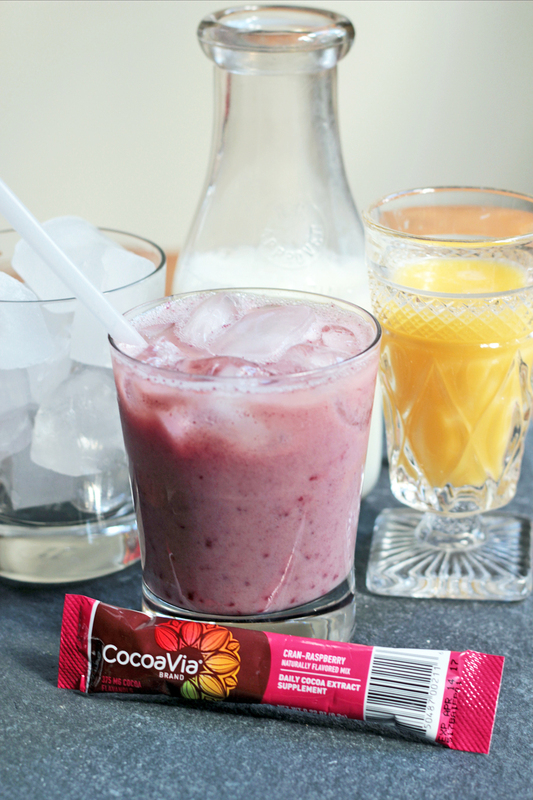 In a 2 cup glass measuring cup, combine milk, orange juice and CocoaVia® supplement packet. Stir the drink to blend. Pour over ice and drink immediately.